Expose your puppy to new people, dogs, sounds, smells, and other experiences. Try to find a variety of each for your dog to experience. Make each experience a “positive” one; be generous with treats and games in the face of new situations. Teach your pup that new things are opportunities to gain rewards, not something to fear. Remember that socialization means teaching your dog that all these new encounters and experiences are GOOD things; exposure is not enough if the dog thinks that the world is a scary place (even if “nothing really bad actually happens”). Maintain this socialization throughout their lives. It is not enough to go to Puppy Kindergarten; you must be sure that your puppy and dog learns that New Things are Good Things throughout their life. It’s a “use it or lose it” deal! Handle your dog’s entire body, including head, feet, tummy and tail. Practice sudden grabs and rushes. Without hurting her, imitate the sorts of poking and pinching a young or mean child might do. Immediately after each bit of rough handling, reward your dog with some of his favorite treats. Make sure your dog is getting mental, physical and social exercise. Dogs are social predators who originally developed relatively big brains to solve problems regarding finding food and maintaining peaceful relations with their packmates. Many breeds were further refined to solve particular problems such as finding hunting targets or herding sheep. Don’t allow that brain to rot – or develop unfortunate games that may involve property destruction! Use work to eat programs: predators have to do intense work to acquire food. Use clicker training; stuffed food toys like Kongs, Kibble Nibbles, etc (see the “Ditch The Bowl” and the Merchandise page), goodie ships, cardboard rolls, and socks; take some sort of class or dog sport. Play “predatory” games, those that involve the skills wild dogs and wolves would use for food acquisition, such as fetch, tug, searching for toy, Kong, food, etc. ; playing hide and seek. See the Games Training Tip for more ideas. Allow them to explore new areas – walk in new neighborhoods or hike along trails. Allow dog-dog interactions, ideally off-leash (in a safe, enclosed area). Even if your dog has only one or two “doggy buddies”, make sure they get to meet frequently. Even dogs who “don’t like other dogs” will benefit from the mental stimulation of having other dogs around (unless your dog is actually fearful or aggressive!). 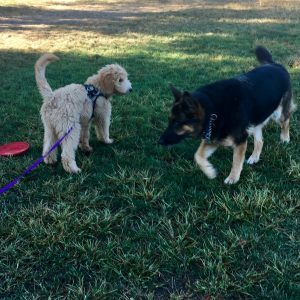 See the Dog Parks page for parks and trails where you can take your dog for a stimulating outing (in the San Jose area). Teach your dog that when you approach their food bowl, it means something good is going to happen for your dog. While the dog is eating, walk up and drop an extra special goodie in. This is going to be way more effective than taking the food from the dog; while your dog might accept that this sort of rudeness just happens in his life, he’ll love having people approach his bowl if it means something GOOD is going to happen! Some dogs might become more protective of it if he thinks it’s going to be taken away. NOTE: if your dog eats faster, stiffens, freezes, growls or snaps at you when you try to do this, STOP and consult a professional behaviorist – you already have a resource-guarding problem! Practice “exchanging” or trading items that your dog has for things she finds equally or more valuable. For example, offer the dog a piece of food when she drops the tennis ball. Or offer a second tennis ball in exchange, if your dog finds balls more valuable than food! If your dog is reluctant, give them the reward when they drop their item but do not take it from them. If your dog refuses to drop or growls, avoids you, or snaps, STOP and consult a professional behaviorist! Ask your dog to enter, and exit, his kennel, the car, her bed, the couch, your bed, etc. Reward each move with praise and a favorite treat (or other rewards, including toys, games, etc.). Teach your dog that moving when you ask him to is worth his while. Praise the dog when he moves out of your way, and teach him a better place to sleep than in doorways or favorite pathways. Dogs must learn how to control their jaws, and they must learn that they can bite softly. It is actually more important to teach a dog to use its jaws gently then to try to teach it to never use its jaws – all dogs are capable of biting out of fear, frustration, pain, or to protect valuable resources. It’s important that when they do feel the need to bite, that they do so with control. In the context of games, teach pups and dogs that their teeth hurt you and that your fun interactions will end the moment they lose control of their teeth. See the Puppy Play-Biting training tip. Give your dog ample opportunities to practice and sharpen her social skills. This will teach your dog how to handle all sorts of situations with other dogs and give her confidence. Start this as early as you can. Your vet may possibly tell you to keep your young pup inside, away from other dogs; expert behaviorists will tell you to go out and introduce your pup to as many friendly (and healthy!) dogs as possible, and the latest policies from the American Veterinary Society of Animal Behavior (AVSAB) encourage early socialization as well. See the Whole Dog Journal‘s article on preventing Parvo for more information on how to keep your pup healthy and safe during their early weeks. Don’t allow your dog to regularly witness opportunities he can’t have. Block his view of people and dogs passing by – shut the curtains, move the couch, or put up a more solid fence or visual barrier to the street. Don’t tease your dog with toys (or allow others, including children, to do so). Most dogs are frustrated when they are not allowed to meet other dogs they see, including those they must pass on leash. Ask the other owner for permission and if granted give your dogs a moment to greet each other and sniff all of the important parts of each other (you can ask your dog to respond to a simple command such as “watch me” or “sit” first). Make sure you hold the leash loosely enough that your dog feels unrestrained and can perform all the proper greeting rituals (see the Body Language page for more information). If your dog lunges or barks at other dogs, it’s possible he’s just excited and already frustrated. You should consult a trainer or behaviorist to evaluate whether your dog has an actual aggressive problem; you could accidentally cause a problem to develop if you only add to his frustration. Some dogs are frustrated by seeing bikes, cars, or other potential “chase” objects go by and will get increasingly reactive to them. Do not allow your dog to practice this. “Aversives” by definition are something the dog fears or finds painful or uncomfortable. Since they change body chemistry, add to physical stress, and create the need for escape/avoidance behaviors, they contribute to a fearful, unfriendly dog. Use management tools such as head halters and leashes to physically control your dog, and use reward-based training techniques to teach your dog how you want him to act. Much credit given to Jean Donaldson, with great gratitude, for this Training Tip. For more information, see her excellent books, The Culture Clash and Dogs Are From Neptune. Also read Patricia McConnell’s excellent book, The Other End of the Leash. Note: If your dog is aggressive towards other dogs or people, and you live in Silicon Valley, I can help! Schedule an evaluation today here. Clear Mind Canine offers a “Feisty Fido” group class for reactive dogs in San Jose and Felton.